Barack Obama should be indicted. Still, US President Barack Obama is playing his last dirty game to sabotage the presidency of his successor. The alleged interferences of Russia into US elections is still unproven, despite the final briefing Trump got from the intelligence community that needed weeks to fabricate the „proof“. These agencies didn’t come up with hard evidence but only with a strong probability, that means still rumors. The whole intelligence report is just hot air or Obama-style rhetorical baloney. The hacking story is pretextual in order to dislodge US combat troops along the Russian border and to emplace the Russophobic US Congress against Trump and his Secretary of State Rex Tillerson. By the way, how can voting machines be hacked or manipulated when they are not connected to the internet? That the mainstream media participate in Obama’s dirty game shows that they have not assimilated Hillary Clinton’s defeat. 95 per cent of the media have been in the Clinton camp and subdued all negative news about her. They were the largest creators so-called of fake news, that means not reporting of real news. It’s not a surprise that the media are all hung up on the Russian hacking spin that the Obama administration created out of deep frustration about the Clinton loss. The Clinton defeat was also President Obama’s personal defeat because he and the First Lady campaigned for Hillary cross country. Also, the hacks into the Clinton campaign and her manger’s email account are still unproven, they are still in the rumor mill. The media should have taken the scandalous revelations about Clinton and John Podesta seriously, instead, they ignored it and scandalized every foolish election battle cry from Donald Trump. 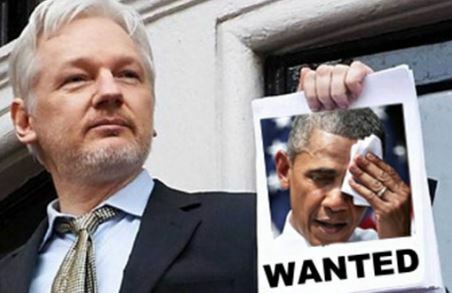 Not without reason, the Obama administration pursues Assange so obsessively. And Hillary Clinton said about Assange after he published cables showing her corruption and derogatory remarks about foreign heads of states as Secretary of State: „Can’t we just drone this guy“? The alleged sexual allegations against Assange in Sweden would have long been forgotten if the Obama administration wouldn’t have put permanent pressure on the Swedish government. Hopefully, Trump will dismiss the trump up charges. Julian Assange made it convincingly clear that he didn’t receive the emails from a Russian source. The former British ambassador to Uzbekistan and a close associate of Assange, Craig Murray, confirmed that he received two dispatches from two different sources in Washington D. C. It seems that it was rather a leak than a hack. As it seems, there were still a few morally decent members in the Clinton team. When a Clinton spokesperson didn’t want to confirm the authenticity of the published emails, he referred to „doctored“ emails implying that Russia might have manipulated them. If these emails were forgeries the US intelligence agencies should have at least found out. The big fuss about the email „scandal“ is just a pretense in order to dissuade Trump from his balanced attitudes towards President Putin and Russia. Obama wants to destroy US-Russian relations and urge the upcoming president towards a confrontational course. Senators like John Mc Cain and Lindsey Graham, both are outspoken warmongers, held already hearings accusing Russia of harming the national interest of the US. The exploitation of the intelligence community by the Obama administration and the Clinton people has led to a loss of credibility of the intelligence agencies. Usually, these agencies shouldn’t be involved in the daily political quarrels. The last time, the CIA was misused was under the George W. Bush administration. Secretary of State Colin Powell had to present false intelligence before the UNSC that led to the attack on Iraq. Trump is less ideological than Bill Clinton, George W. Bush, and Barack Obama. He doesn’t want to change the lifestyle of other peoples and the political system of other nations. Every nation should mind its own business. Trade deals are a top priority of the Trump administration. Whether Trump can stick to his guns remains to be seen. Despite the intensive briefing of the incoming US president, Trump didn’t denounce Putin. So far, it is unprecedented that a US president didn’t publicly endorse the findings of his intelligence agencies. In the long run, this could endanger Trump’s life. The fate of JFK’s assassination looms over the head of every US president who doesn’t play according to the rules of the Deep State. Besides other things, perhaps Donald Trump has to learn this, too. That the mainstream media are still against Trump and do not criticize Obama’s blatant spin shows that they haven’t recognized the signs of the times. In the future, Donald Trump is going to go unconventional ways of communications with Washington’s media crowd. There will be more tweets and fewer briefings for the White House press corps. The whole Obama and the Deep State’s bogus can be seen here. The working of the US Intelligence Agencies should be investigated and all the responsible people should be sacked. They have made a fool of themselves on the order of Barack Obama and the corrupt Clinton gang. Their credibility is nil! The public shouldn’t believe a single word they say in the future. Dieser Beitrag wurde unter US-Aussenpolitik abgelegt am Januar 8, 2017 von Ludwig Watzal.